MSL PRESSURES - INITIAL ANALYSIS INDICATES ANOTHER CLOGGED DUST FILTER AND INCORRECT PRESSURES. MSL reported pressures, winds, temperature and relative humidity are HERE. FIGURE 1 above - Daily pressure and temperature fluxuations are shown with pressures in Pascals and temperature in Pascals. The hypothesis with the Vikings was that when it got colder outside, the RTG heaters pumped more heat into the area around the pressure transducers. Air trapped behind a clogged dust filter then saw its pressure rise as the heat was applied. When the RTG heat was no longer shipped there, the pressure fell. A first look at sol 10 suggests something like this might hav happened again. This will need to be related to initial confusion about methane detected by the SAM. It turned out that it was not Martian air, but rather it was trapped terrestrial air. FIGURE 2A and 2B below. Figure 2A shows gtound and air temperatures for MSL Sols 10 through 11.6. Figure 2B shows MSL pressures for Sols 9.5 to 13. Pressures and Temperatures for Figure 1A to 1D and 2 are taken from http://www.spaceflight101.com/msl-rems-science-reports.html. WIND BOOM MALFUNCTION AND OTHER REMS PROBLEMS. The following analysis of the JPL-admitted windboom malfunction and other problems is from the same link used for Figures 1A-D and 2. Comments by Barry S. Roffman are given in dark blue font. All suggested corrections to or comments about this article should be directed to him at Arkhunt@Juno.Com. Possibly, these pebbles could have hit the fragile hardware on the mast which was in its stowed position with the REMS booms facing outward, leading to the damage teams are seeing. With this permanent damage on their sensors, the REMS team had to start the process of learning how to take satisfactory wind data with one degraded sensor. Luckily, REMS has wind sensors on both of its booms so that there was still the option of returning sufficient wind data to meet the science objectives of the instrument. Comment – all REMS daily weather reports published up until September 8, 2012 show wind from the east at 2 m/s. This wind is not anywhere near the velocity required to move sand dunes or to fill in rover tracks as is discussed elsewhere on this web site at MOVING SAND AND MARTIAN WIND. Further, the data will be suspect until there is some variation in direction or wind strength seen. The average pressure detected during the first 19 Sols on Mars was 730Pa which was as expected. The pressure on Mars shows a daily variation and a seasonal variation. The seasonal change is caused by Carbon Dioxide being converted into its solid phase at the Poles according to a seasonal cycle – meaning that gaseous CO2 is removed from the atmosphere resulting in a loss of total atmospheric mass and pressure. Comment – This is as has been widely accepted since the Viking missions. However, it supposes that the Viking pressure curves are correct and that they reflect ambient atmospheric conditions. We challenge that assumption, believing that just as landing conditions knocked out at least one wind boom on MSL, the dust clogged all dust filters and left transducers to measure pressure changes all due to RTGs on the Vikings and Pathfinder, or the steady drop in pressure as the temperature fell on Phoenix where there was no RTG. As Figure 1D shows above, there is an extremely suspect link seen again on MSL between falling temperatures and rising pressures. This is properly seen on Figure 1B, but shown with an inverted pressure curve on Figure 1D to emphasize how very similar the relationship appears to be. We are therefore confident that the pressures being transmitted from Mars do not correspond to actual ambient pressure. FIGURE 3 below - To understand Martian weather you need to know both the pressure and the month. Both have been listed incorrectly by the REMS team. Now that the mistakes have been corrected we can start to analyze the data to see if it truly represents ambient conditions on Mars. FIGURE 4 - The REMS Team, after our repeated nagging of JPL's Guy Webster on his issue, finally changed the units it was using from hPA back to Pa. This makes to harder to prove higher than advertised Martian air pressure than advertised, but given the errors that we caught above, it does not end our investigation, as Figure 1D indicates. WEB SITES REPORTING WEATHER AT MSL AS OF OCTOBER 4, 2012. There are two web sites linked to the REMS team that offer weather reports for the MSL. The first is the one referred to above at http://cab.inta-csic.es/rems/marsweather.html. In addition to its confusion for five days in September about units (hPa vs. Pa), it also offered confusion about the month on Mars. It started with month 3 (incorrect), changed that to month 6 (correct) and then slipped back on September 13, 2012 to month 3 again. After I published the previous sentence, they fixed it once more the following day. The current month is 7. A second web site with a weather report is at http://marsweather.com/first-rems-weather-report/comment-page-1#comment-254. But it too has problems. Until October 4, 2012 it always listed the length of daylight on Mars as 11 hours and night time as 13 hours, with sunrise at 6 AM and sunset at 5 PM. Obviously this was an original approximation, but it should show the daylight time as longer than the night time, especially now that the equinox has passed and the MSL site moved from late winter into early spring by September 30 when Ls 180 was reached. The MSL touched down at latitude -4.59 (that is, 4.59 degrees south). At a similar latitude on Earth is Mombasa, Kenya. The tilt of the Martian axis is similar to that of Earth, 25.19 degrees (compared to 23.4 degrees on Earth). If we look at the sunrise and sunset times in Mombasa for August 22, 2012, a month before our equinox, the sunrise is at 6:24 AM and the sunset is exactly 12 hour later at 6:24 PM. This close to the equator, as should be true on Mars, sunrise and sunset times don't vary widely during the year. At the equinox on September 22, 2012, sunrise on Mombasa is at 6:11 AM and sunset is at 6:17 PM. The amount of daylight in Mombasa on the solstices only varies between 11 hours 53 minutes on June 21 and 12 hours 21 minutes on December 21. Given the extra 1.8 degrees of axial tilt on Mars, there should be a little bit more variation in daylight at MSL than on Earth over the year there, but not a lot. On October 4, 2012 Ashima finally posted a change in sunrise and sunset times, with sunrise listed for October 2 (Sol 56) at 5:31 AM and sunset at 5:09 PM. That still amounts to a longer night than day by 22 minutes. The other question that remains about the second website is who controls it. The site states that “MarsWeather and MeteoMarte are provided as a service by Ashima Research. These websites are / were not funded by NASA, by any agency of the US government, nor by any agency of the governments of Spain or Finland.” But elsewhere it states, “Ashima Research is a part of the science team for the Rover Environmental Monitoring Station (REMS) – the rover’s weather station.” So they first allow for no Government responsibility, and then they reveal that they are a paid part of the NASA assigned REMS team. Despite the odd disclaimer, the Ashima folks seem to be a serious group. Of immediate interest is that the Ashima people have developed a new General Circulation Model which I have only skimmed through. They state that, "The good news is that the new model does much better than all prior Mars GCMs. The bad news is that the model still under-predicts argon in the southern polar winter." One might think that more argon than they predicted would imply more air pressure than they planned for, but that is not (yet, at least) their conclusion, which asserts, "We are also able to reproduce a seasonal CO2 cycle that closely matches the surface pressure measurements at Viking Lander 1 and 2." While Ashima began a blog on August 31, 2012, they have not responded to or printed comments by anyone after September 2, 2012, when the last amusing entry was entered by someone named Philco wrote, "CAB (Centro de Astrobiologia), lost in comma... REMS data from CAB has an average daily ground pressure of 742 hPA? Good, but then where was I when Man terraformed Mars?" Ashima has deleted all our questions and comments from their blog. For now I'll give them the benefit of the doubt and say that this is probably because they have been too busy preparing for a convention in Copehagen on September 14, 2012. Meanwhile, we may well have to wait until the full data set is published at the PDS website before we can see what the Government contends is really going on weatherwise at MSL. Some of the weather reports that I missed at the above two weather sites were available at https://twitter.com/MarsWxReport. It did report the extremely high pressures above 740 hPa for Sols 26 to 29 (September 2 to 5), but for Sol 25 (September 1) it reported 7.42 hPa rather than the 742 hPa reported at http://cab.inta-csic.es/rems/marsweather.html. FIGURE 5 - As with the mistakes caught on the REMS reports, there are an abundance of reasons to question which transducers were sent to Mars in the past. On the CAD below, the same design was used for transducers with vastly different ranges. Figure 6 below shows that the inverse relationship betwen temperature and pressure is not just seen on a daily report for MSL. It is seen on a yearly basis for Viking 2. 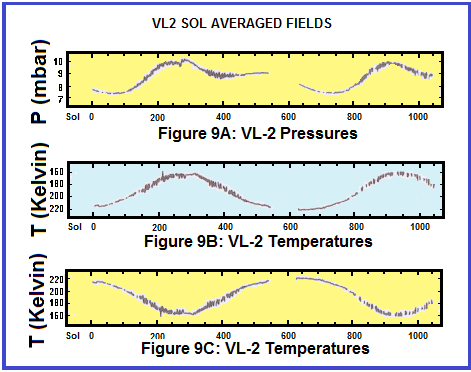 These graphs sum up Viking-2 sol averaged temperatures and pressures. Figure 9A and 9C show that as temperatures fell, often pressures rose. To counter falling temperatures, RTGs kick on to maintain internal temperature stability. As this occurs, air trapped behind any dust clot would experience a pressure increase. When the Figure 9C graph is inverted and displayed as Figure 9B, the temperature and pressure graphs are nearly an exact match, just as we saw above with Figures 1A to 1D. The biggest discrepancy below is after a hiatus with no data between Viking 2 sols 560 to 633 (Ls 68 to 100 in Martian spring to summer). VL-2 pressure readings were often stuck for 10 hours to six days (see Annex C for VL-2 sols 639-799). When pressures were stuck, temperatures were not. Figure 6 - Annual Pressures and Temperatures at Viking 2 show the same inverse relationship as at MSL in Figures 1A to 1D.